The course provides an overview of (1) radiobiological and physical principles of radiation oncology (2) technical innovation in precision radiotherapy (3) the route of the radiotherapy patient – via diagnosis, imaging and treatment planning – to therapy. 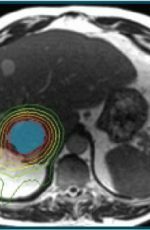 Topics that will be addressed: effects of irradiation on the DNA and cellular level; radiation response of tumours and normal tissues; physics of modern conformal radiotherapy; imaging; treatment planning; fractionation and hypofractionation; particle irradiation; image-guided radiotherapy; brachytherapy; radiotherapy in combination with chemotherapy, targeted agents, hyperthermia and immunotherapy; treatment of breast cancer, lung cancer, gynaecological and head & neck tumours; quality of life and late effects. New and exciting developments in radiation oncology will be addressed. 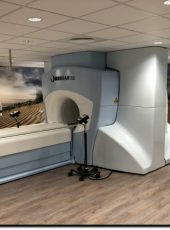 The course encompasses three practical trainings: (1) the radiobiology laboratory (2) computer-based target volume delineation (3) patient treatment simulation on a linear accelerator. In addition, three PhD students will be invited to give an overview about their research project. OOA PhD students, researchers and trainees in oncology with biological, clinical or physics background, having particular interest in the principles and therapeutic effects of radiation. Metabolism and epigenetics, cancer dependencies, cutting edge ‘epi’technologies, tRNAs in cancer, mRNA modifications, DNA (hydroxy)methylation, immune cell programming, 3D chromatin structure, epigenetic reprogramming. 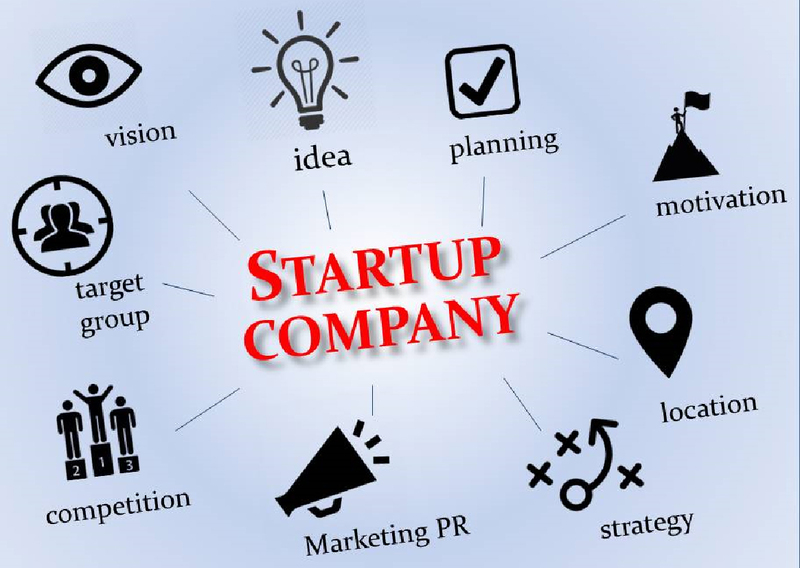 Ever thought of starting a company based on your research results? Or patenting your own research data? This is possible! This course shows you how. When scientific discoveries are developed for commercial application, success of entry into the market is dependent on many factors. Among these are intellectual property, indication selection, (pre)clinical testing and financial aspects. This 2-week course is to get Master’s and PhD students familiar with the ideas and concepts behind the valorization of research ideas and technology. The course will give insights in the identification of research or research ideas that can be commercialized, performance of proof-of-concept validation, the road through patent protection of obtained results or technology, pre-seed financing of research, formation of a start-up company and the development of a product into the market. There will be seminars by a selection of top-notch speakers, ranging from researchers with starting spin-off companies, experts on grant writing, patenting, regulatory issues, as well as finance and venture capital, to captains of industry and CEOs of large and successful companies. • What are the many factors involved in getting laboratory discovery to a novel approved medicine? • How does big pharma and biotech industry access innovation? • How do entrepreneurial universities contribute to innovation? • Which party plays which role at all stages? • What are the keys to success? There will be 24 contact hours, including lectures, lecture repetitions and discussions by the course coordinators and a number of invited lecturers. These will include external experts on molecular diagnostics and regulatory affairs, VUmc colleagues with presentations on their own spin-off companies, and colleagues of the Technology Transfer Office on legal and patent issues. In addition, the course consists of independent learning on the basis of exploring literature and business reports on selected topics. All lectures will be preceded by formulation of expectations and followed by lecture repetition sessions. Next to classes and discussion sessions, there will be six assignments to elaborate in groups of 4-5 students. Reporting will take place by dedicated presentations or written reports. On the last day of the course, students will present a business plan for a start-up company. There is a requirement for 90% attendance. There is no general exam. ImageJ or FIJI (stands for Fiji Is Just ImageJ) is a public domain image processing and analysis program. It is freely available http://imagej.nih.gov/ij/index.html. The main objective of this course is to give the microscopy user a global understanding of the huge potential of the program. We will go through all functionalities of the basic package and present specific tools for use in (cell) biology. During the course we will also review concepts and principles of image processing in general, in order to set a theoretical background. The course is split over 2 days, both featuring theoretical presentations and interactive practice examples, and is intended for all microscopy users who are interested in image processing and analysis. The course is split over 2 days, both featuring theoretical presentations and interactive practice examples. We will introduce the basic concepts of microscopy image analysis, such as color handling, bit depth & multi-channel images. It will cover image processing in ImageJ and an overview of the many ​ image analysis functions within this free software package. We will show you how to open images from proprietary file types (such as Leica .lif and Zeiss .czi files), how to get from raw data to a multi-panel, multi-color paper or talk figure, create multi-color images, add scale bars, work with hyperstacks, and install and use plugins and macros. You will learn how to enhance and filter images, use multichannel images and stacks, and perform basic analysis such as counting cells, segmentation and intensity analysis. In the afternoon session of day 2, we will cover more advanced analysis, identification of cell subtypes in multichannel images, colocalisation and how to write macros. Aim of this course is to give an introduction in the histology of malignant tumors and their precursor lesions. Microscopical structures, growth patterns, grading and staging systems, and different cell types present in selected tumor types will be explained and discussed by pathologists. Many research projects focus on tumor biology in order to predict survival or therapy response, using DNA-, RNA- or protein-based tests. 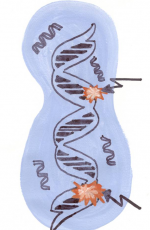 Also, understanding biological mechanisms of a tumor may reveal new targets for future treatment. While many PhD students in cancer research nowadays have a background in molecular biology, few are well acquainted with histological characteristics of tumors, and the clinical significance of histopathological findings. In daily clinical practice histopathological examination of tissue is the mainstay and gold standard of a cancer diagnosis. In addition, the choice of treatment largely depends on pathological variables. This OOA course provides introductory hands-on training in histopathology of tumors. The course aims to provide better insight in the histopathology of various tumor types, in relation to diagnostic, prognostic and therapeutic significance. As the course includes an introductory session, only basic knowledge on histology is required. The histopathology of human tumors course comprises hands-on sessions using scanned slides, plenary expert talks and multihead microscopy sessions. Detailed course program – coming soon. We are pleased to announce the OOA retreat 2018! This year the retreat will take place from Wednesday October 10th until Friday October 12th. The accommodation is again hotel “De Zeeuwse Stromen” in Renesse, Zeeland NL: www.zeeuwsestromen.nl. All meals, coffee, tea and (shared) bedroom are free of charge. All participants are obliged to stay the three days of the retreat. Busses from NKI and WTC will bring us to Renesse in 1 hour and 45 minutes. The format will be more or less the same as last year: first-year graduate students will present a poster. If you started your PhD more than one year ago, you have to present your work in a 12 minute oral presentation. For each session, two chairpersons will be assigned who will also give a brief introduction of the session. All participants submit an A5-page abstract in English. At the annual OOA retreat awards are given. There will be three awards for best presentation and best poster and also for best chair. For organizational reasons and due to other commitments we must set the deadline for registration on Sunday August 26th at 23.59 hrs and not later. If we reach the maximum number of 170 participants, we have to close the registration earlier. Instructions for abstract: Please use this template for your abstract. The maximum size is 2250 characters (with spaces – to be seen at Tools in Word). Make use of some subject headings: Background or introduction/methods or aim/results/conclusion. Pictures/graphics are allowed but will be printed in black and white. You can also put a picture of yourself in the abstract so people can recognize you. Not obligatory. All abstracts will be assembled in an abstract book with the program to be distributed well in advance of the retreat. Instructions for presentations: prepare a presentation of 12 minutes maximum. Be aware that detailed data, endless sequences etc. are rarely interesting in a presentation for an audience that represents a wide range of subjects, so it is essential to avoid these as well as jargon, unknown abbreviations, etc. Save your presentation on a memory stick. Laptops (Windows) and beamers will be provided by the hotel. On Thursday you have a free afternoon. The hotel is situated near Renesse (1 km) with several pubs and shops and the beach is not far (300 m). The hotel has a small swimming pool. If you have an idea for an activity (like blokarten or powerkiten) and you want to organize this, let us know. 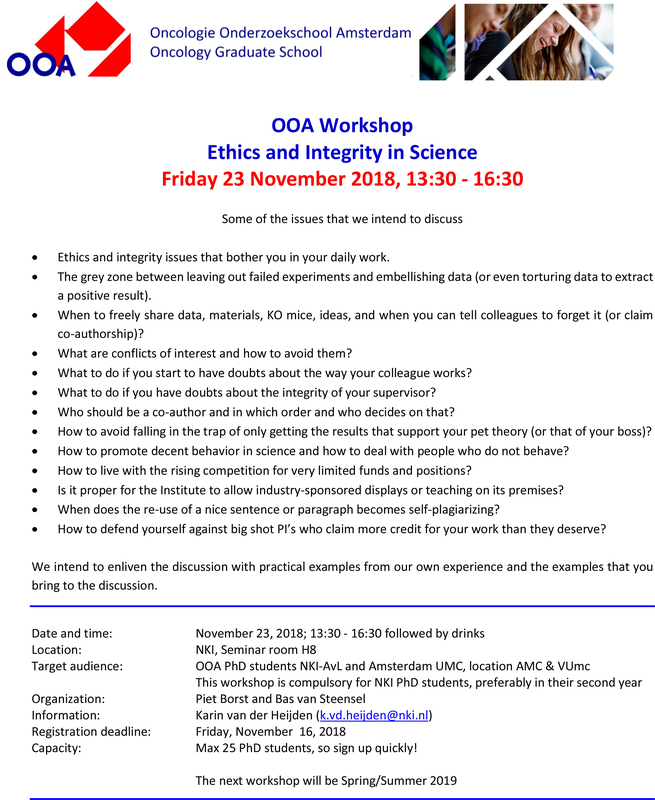 PLEASE NOTE: The OOA student retreat is THE opportunity to present your data and to exchange ideas. But be aware: it is a public meeting, so do not share patentable information in your presentation, discussions or other exchanges. This may include methods, protocols, processes, hypotheses, ideas, etc. that have not been published yet. Once revealed to the public it can no longer be claimed as an exclusive right. Kind regards, also on behalf of Hein te Riele, dean of the OOA at the NKI/AVL.